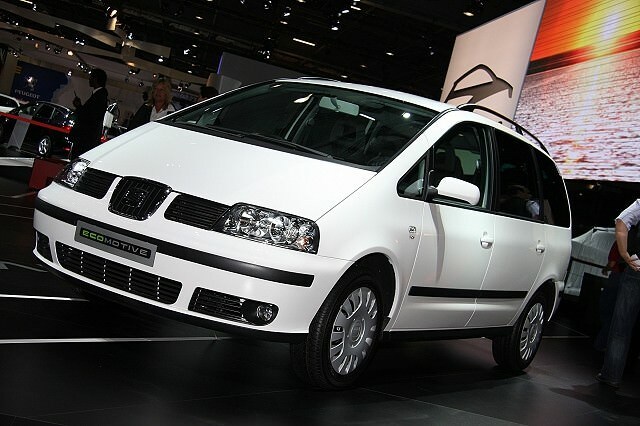 A car born of Volkswagen Group's platform sharing, the SEAT Alhambra is the Spanish firm's version of the Volkswagen Sharan. A car born of Volkswagen Group's platform sharing, the SEAT Alhambra is the Spanish firm's version of the Volkswagen Sharan, which in turn shares all but its badges with Ford's Galaxy. Confused? You don't need to be; just remember that the Alhambra was always the value model of the three full-sized MPVs, meaning that, typically, the SEAT offered a greater standard equipment count over its Ford and Volkswagen alternatives. Badges, and a few minor trim pieces aside, it's all but identical to drive, to sit in and own, though it should be a bit cheaper to buy simply due to the SEAT badge lacking the clout of those Ford and Volkswagen alternatives. SEAT's largest family offering arrived in 1995, being facelifted around 2000, before remaining on sale for a further ten years - seeing further minor improvements in 2004. The engine range elsewhere in Europe encompassed everything from 1.8-litre turbocharged petrol units to a 2.0-litre petrol and even a 2.8-litre V6, but you'll be hard pushed to find anything but a 1.9-litre TDI in Ireland. It was offered in a variety of outputs, from 90hp in early cars, or 110-, 115-, 130- and 150hp versions. The last models were also offered with a 2.0-litre TDI engine, producing 140hp. The Alhambra is all about space, the large family machine seating seven comfortably, the rearmost seats folding away in the boot when not in use. The boot is small when those pews are occupied, so if you've a big family and want to take luggage too then a roof-box might be the only sensible solution - or pack light. Given the length this car was in production, the trim level names have changed a number of times, but it's pretty unlikely you'll find an Alhambra that's not got air conditioning, electric front windows and alloy wheels. There's an auto choice that makes for easier driving in traffic, but the penalty is felt at the pumps, it not being as economical as its manual relatives. Earlier cars made do with a five-speed manual gearbox, while the more powerful models - and later examples - gained a six-speed manual as standard. Despite its age the Alhambra always acquitted itself decently on the road, and while not quite able to live up to SEAT's sporty reputation it steers with precision and rides decently. Refinement is also good too, even if the diesel engine can be a touch vocal on start-up. Quality is good as well, the Alhambra feeling well up to the task of surviving everything a family can throw at, and in, it. The limited engine choice simply underlines the best engine option. The 1.9 TDI is the one to go for, and in all honesty it matters little which output you pick. Certainly the higher power models will be a bit quicker, but even the 110- and 115hp units deliver adequate performance - even with a full complement of passengers on board. As to trim, buy on what you can afford; all come decently specified, so choose on colour, location and condition rather than focssing on trim levels. Newer rivals have better NCAP scores. It might have been around forever, but the qualities that made the Alhambra attractive back when it was launched last century remain appealing today. Its age means it's not as crashworthy as more recently introduced rivals, but good specification, emissions, economy, space and decent driving characteristics all play in its favour. A good all-round family car.